* You can use the 15th Edition through August 2019 by going to our Texas Alerts page and downloading the changes enacted by the Texas Legislature in 2017. If you’re involved with a divorce in Texas—any stage of any kind of divorce—How to Do Your Own Divorce is a book you really must have. I explain how Texas law defines property and debts and how they are divided, how alimony is determined, and how custody and visitation for minor children will be determined if you end up in court. It answers all kinds of practical questions that most people have about getting divorced. Finally, this book is a complete kit for an uncontested case. It includes the forms you need to file your Petition and get your Decree, with step-by-step instructions. If you don’t want to do the paperwork yourself, my book helps you find a professional to do the paperwork for you and it enables you to supervise their work. How to Do Your Own Divorce has been a famous best-seller since 1980—over 30 years! It has helped hundreds of thousands of Texans save hundreds of millions of dollars, so I know it will help you. In fact, I guarantee it! Includes CD with forms, kits, codes, resources. 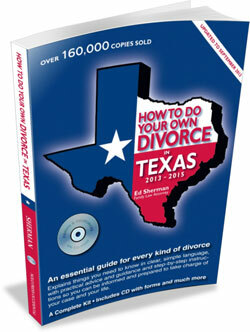 Hundreds of thousands of Texans have successfully done their divorces using this book. Famous in Texas since 1980, this reliable guide tells you about the things you need to think about and things you need to do if you are considering a divorce. It gives you information and advice to help with the decisions you must make. It shows you exactly how to do your own divorce and provides the forms you will need to do it. I just completed my divorce using How to Do Your Own Divorce in Texas, and I am unable to fully express the depth of my gratitude! Because of this book, we had a painless, less-than-$200 easy divorce. We were able to keep things civil and simple, thanks to the author, Ed Sherman. I want to thank him for his foresight and knowledge, and the humor in the book was a breath of fresh air. Thanks to you, a difficult situation was made easier. My appearance in court was a ”piece of cake” I'm happier than I have been in a long time!